The lil guy we babysit, "Mr. Cool" has been joined by a brother. We will call him Mr. Dimples. He is now a year old. I know it's been too long. Mr. Dimples gets his name from his dimples. Pretty obvious right? That kid's smile will light up a room. Best part of my morning is when the boys' dad drops them off and I get that first beaming grin. Heart shattering. Did I mention he can whistle? A year old and that lil guy can whistle! For reals. Mr. Cool is also growing up. He is a character. Cracks me up. Right now he is obsessed with decorating. He loves Halloween and was shocked by my meager decorations. When Halloween was over he was sad to see them put away. He would be happy with Halloween year round. We had to replace those decorations with Fall/Thanksgiving decor. Then he informed me forlornly that his mom would not buy Thanksgiving decorations. Ha. Sorry about that one! Needless to say he was really in his element when it came time to decorate for Christmas. Every time we would get to the end of one box he would demand the next. Tragically we finally got through the last box. I really don't know what we will do when Christmas is over. I guess I am going to have to up my Valentine's decoration supply. Which right now consists of... I think I have a heart shaped plate somewhere. The Princess loves all things crafty. The artistic gene skipped right over me and went from my mother to my daughter. That is fine. I will let them do all the work and I will just appreciate the beauty!! Did I mention that the Peanut is 10 now??? Double digits. Where has the time gone? As I type he is leaning over my shoulder reading what I write. Now he is cracking up. And calling out suggestions. He is my story teller. His dream is to grow up and be a YouTuber. Which is basically the new rock star or sports star. The ultimate dream job. The height of celebrity fame. He and the Princess even dressed up as popular YouTubers for Halloween. Oh. And there is a story to tell about that. Can I just tell you. No matter how long you are a parent. There are always new mistakes to be made. How is that for a preface? 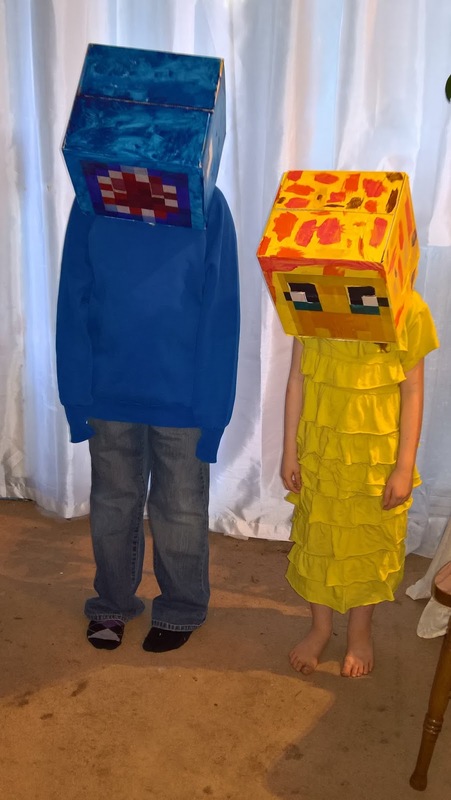 For Halloween, the Peanut and the Princess decided that they wanted to be "iBallisticSquid" and "Sqaishey." 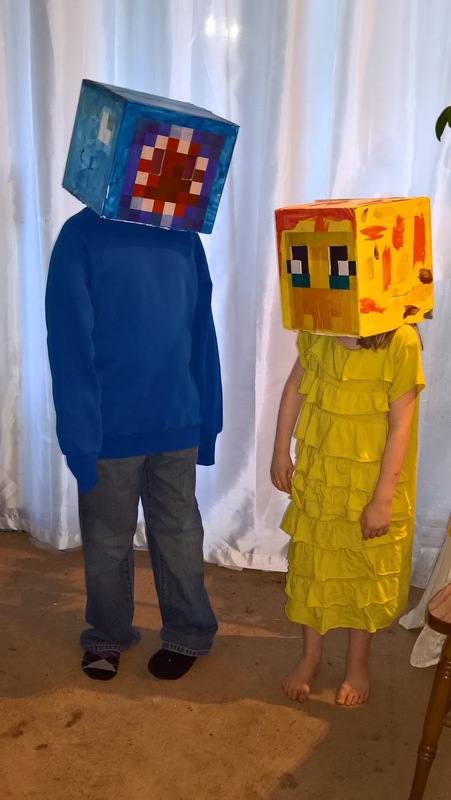 Both are Minecraft YouTubers they love to watch. Friends of "Stampy." Popular with the younguns nowadays. For whatever crazy reason, they don't sell those costumes. Kids decided to make them themselves. Fine as long as I don't have to have any crafty skills. I was more than a little skeptical. They were basically on their own. They came up with the design. I did find a printable for each of the faces and they found just the right size diaper boxes. A little procrastination came into play so we found ourselves starting a few days before Halloween. My husband and I helped by spray painting the boxes white to act as a base. After that had dried overnight we let them paint their own "heads." Once that had dried we glued on the faces and cut some eye holes. I can't deny being pretty impressed with the outcome. Letting them create their own costumes. Total parenting win! Right? Out we went on our usual route. First to Granny's house. Then we wound our way down her street and then across to our neighborhood. Normally we kind of snake up and down the side streets but there weren't a ton of lights down those streets this year so we stuck to the main street. Basically way less ground coverage than usual. Those boxes on their heads made walking a bit complicated. 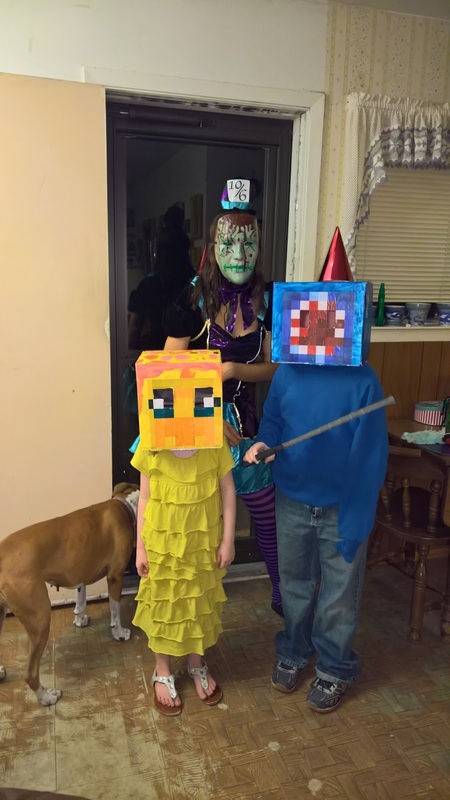 This is not the first Minecraft costume worn by one of my kids so we were prepared for that. Most of the time we just put their heads on when we got to a house and then took them back off for walking. Still the Peanut was really stumbling around walking up to the door. Then we realized that was mostly due to natural clumsyness. The sidewalks were not the most level but he really was having a difficult time. And maybe we stayed up too late the night before working on the finishing touches for their costumes because they seemed pretty tired and out of it. The Princess was barely talking at all. Normally we are out there until my husband and I are completely worn out but the kids keep begging for more. This time they were lagging pretty early and both seemed ready to call it a night. Perhaps you see what is coming. 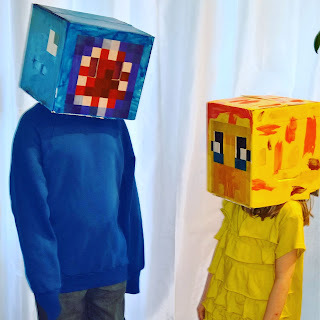 That is when my husband put one of the boxes on his head and said. "Wow. Those paint fumes are still a little strong!" And that was the end of the Trick-or-Treating that night. Luckily by the time we had walked back to the house they seemed back to themselves. And they really hadn't had the heads on much at all. They ended up with just the right amount of candy. Pretty much had it all eaten in a few days and we were done with it. Next year we will have to follow the simplified route.